Of all these applications, 21 of the applications were withdrawn by the applicant. 18 were withdrawn after we had submitted a comment; 3 of the applications were withdrawn by the applicant before we had submitted a comment. Of all these applications, 1 of the applications were closed with a reason "Planning permission not required". 1 of these was closed after we had submitted a comment. All of our comments eventually showed on the on-line system, though we reported 12 filing problems to be corrected to get the text made properly visible to the public. 2 documents were filed but not in the standard PDF format. All of these were corrected after we reported them. We examined the Appeal documentation of all of the appeals against refusal and we concluded that our objection comment was detailed enough that no further input was needed into the appeal process. Two of the council's decisions to permit were challenged in the High Court, and both of them resulted in the planning decisions being quashed. We were informed a long time ago that when a retrospective planning application was refused, that refusal would automatically be passed to Enforcement for action. How often this happens we don't know, because the Enforcement register is not on-line for the public to view. If there are any further improvements made to the planning system, an index of enforcement cases quoting the number, the status (ongoing or closed with the outcome), the address and a brief description of the substance of the case would be very useful. We don't think that there is a need to have the documentation available. We noticed last year that one application was approved on the assurance by the applicant that the modification to the listed building had been removed. It hadn't, and in November 2017 we raised an Enforcement Case to get it removed. That case still hasn't been allocated a case number and the offending modifications still have not been removed. We reported to Enforcement 4 cases in 2018. We were advised of case numbers for 2 of these. No case numbers have been notified for Hobbycraft, despite their appeal against the refusal for their retrospective planning application being dismissed; nor for Oldfield Park Junior School despite sending our reminder that we had received no acknowledgement of receipt of our initial case paperwork. We were advised of an outcome for 1 of the2017 cases on the basis that advertising consent was given in 2018, but we are unable to close that case yet because the associated Listed Building Application is still pending and therefore the approved signage cannot yet be installed. 3 other 2017 cases and one 2018 case were satisfactorily closed, one of which was confirming that no action would be taken because if a Listed Building application was to be raised it met council policies and would be given consent. In a number of our comments on Listed Building applications we have expressed our concern and disappointment that no pre-application advice had been sought. We are also concerned that on a few occasions the Conservation Officer's recommendations on planning applications for listed buildings that pre-application advice should be sought before planning decisions are made, that advice was not pursued. The Development Management Committee sometimes shows insufficient care of the heritage assets, despite the legislative background to the determination of normal planning applications and listed building applications being different. We reported the same thing last year. We would still like to see a policy review to tackle this issue. On a more positive note, we understand that there are suggestions to make pre-application advice more easily available to the public. We welcome such a development and look forward to it coming to fruition. In 2018 we monitored the applications for conversion of residences into HMOs. We recognise that not every application for conversion to HMOs is targeted as student accommodation, but the majority of them are. We also recognise that our statistics which follow do not include those existing HMOs being enlarged due to extensions/loft conversions etc for which they don't need planning permission and therefore difficult to quantify from public documentation. The applications permitted result in a loss of 53 residences and creation of 251 HMO bedrooms (which could be more people if double rooms). The applications pending consideration could result in a loss of another 14 residences and creation of another 62 HMO bedrooms (again could be more if double rooms). Each residence which becomes a student HMO represents a loss to the council of Council Tax, because the Government Grant no longer covers such losses. What is clear is that the policy is not really spreading the HMOs across the city but is continuing to concentrate two thirds of them in the south adjacent to the already saturated area. Effectively, the current policy is just extending the already saturated areas rather than the stated aim of spreading HMOs into areas of Bath remote from the saturated areas. This is creating increasing issues over public transport which is now causing access problems in the relatively narrow streets in the area due to an increase in size and number of vehicles. Also, the sheer number of university students exceeding the capacity of the buses in the mornings makes it virtually impossible for children relying on the same bus routes to get to school to arrive on time, which increases the use of private vehicles for the school run. On a separate page of this website we have been recording the service problems with the Council's on-line facilities. Our diary chronicles the experiences that any user of the website would have seen from time to time. The problems recorded during 2017 were very few, and are all about periods of unavailability of the service, most of which have been associated with a software delivery process. The number of problems in 2018 were so few that the page cataloguing service problems is unlikely to be needed in 2019, but we will leave the page on-line for a while as a historical archive. 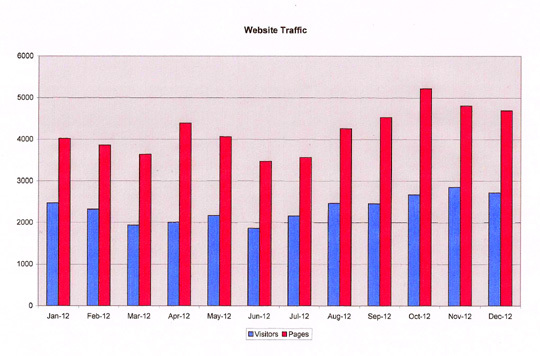 We have again analysed the traffic experienced by our website graphically as well as examining the underlying figures. In round numbers we had 15,300 separate visitors making a total of 33,000 visits to our website this year, and in total they looked at just over 73,000 pages. On average each visit was to read 2.2 pages. 73,000 pages is an average of 200 pages read for each day in the year, or about 6,100 a month. 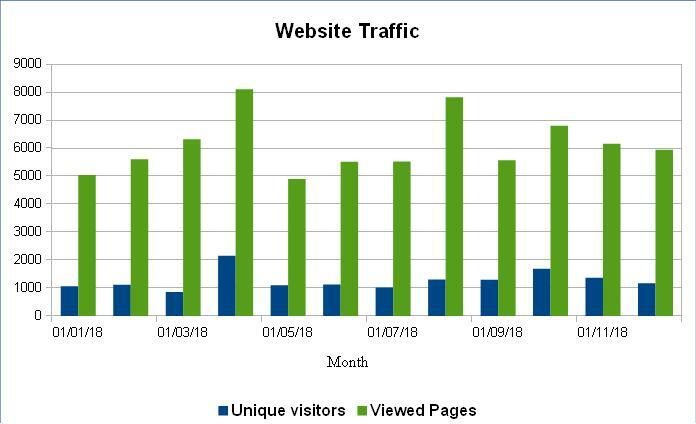 The days with the most traffic were August 24th, April 4th and July 9th, with March 9th the only other day with more than 1000 pages viewed. This year's traffic had a large number of overseas readers. As expected, Great Britain viewed the most pages, but that only accounts for just over 40% of the pages viewed. 86 different countries made up the remainder of the visitors. The combined totals of top three non-UK countries, USA and the Russian Federation and Ukraine accounted for another 40%; and the next highest are (in size order) Netherlands, Germany, Ireland, China, Japan and Latvia. What these statistics demonstrate is that a lot of the world is interested in what is happening in our World Heritage Site. The entire website consists of 65 pages containing 1030 pictures, 90 Decision Notices, 204 comments on applications, 81 Enforcement cases, and 113 other documents. In November 2018, Watchdog responded to an invitation to exhibit at the Bath City Football Club which was hosting a Twerton in World War 1 event. We featured music from the WW1 years and much of our research into the industries in Bath during that time. Among the other exhibitors was the collection of artefacts owned by the council's first Heritage Champion. Discussions between him and us and the representatives of the football club indicated that it might be once again possible to run an "Industrial Heritage" event without a room rental charge, so we indicated our willingness to exhibit if such an event took place, and then left the Heritage Champion and the Football Club representative to discuss and decide on date, location and content. When such an event is confirmed, we will advertise it on our website, as before. Of all these applications, 20 of the applications were withdrawn by the applicant. 14 were withdrawn after we had submitted a comment; 6 of the applications were withdrawn by the applicant before we had submitted a comment. Of all these applications, 2 of the applications were closed with a reason "Planning permission not required". 1 of these was closed after we had submitted a comment; 1 of the applications was closed before we had submitted a comment. All of our comments eventually showed on the on-line system, though we reported 23 filing problems to be corrected to get the text made properly visible to the public. 3 documents were filed but not in the standard PDF format. We also noticed that one development had Decision Notices quoting the same version numbers for drawings on both FUL and LBA, but only the document set on the FUL had those versions filed. 4 of the Refuse decisions went to appeal. We examined the Appeal documentation of all of them and for one of them we concluded that our objection comment was detailed enough that no further input was needed into the appeal process. One was being handled by a Commercial Appeal Process and we couldn't comment. We provided additional input into the appeals of the other two. We noticed that one application was approved on the assurance by the applicant that the modification to the listed building had been removed. It hadn't, and we raised an Enforcement Case to get it removed. We reported to Enforcement 20 cases. We were advised of case numbers for 12 of these. We were advised of an outcome for 2 of these, one of which was that no action would be taken. In a number of our comments on Listed Building applications we have expressed our concern and disappointment that no pre-application advice had been sought. We are also concerned about the number of planning applications for listed buildings where advice is given by officers with insufficient or no expertise in listed buildings, and the advice given shows insufficient care of the heritage assets, despite the legislative background to the determination of normal planning applications and listed building applications being different. On a more positive note, we understand that there are plans to make pre-application advice more easily available to the public. We welcome such a development and look forward to it coming to fruition. The problems recorded during 2017 have been very few, and are all about periods of unavailability of the service, most of which have been associated with a software delivery process. If the trend for a reduced number of problems continues into 2018 we will consider discontinuing the page cataloguing service problems. In round numbers we had 27,100 separate visitors making a total of 61,900 visits to our website this year, and in total they looked at nearly 79,000 pages. On average each visit was to read 1.3 pages. 79,000 pages is an average of 216 pages read for each day in the year, or about 6,560 a month. 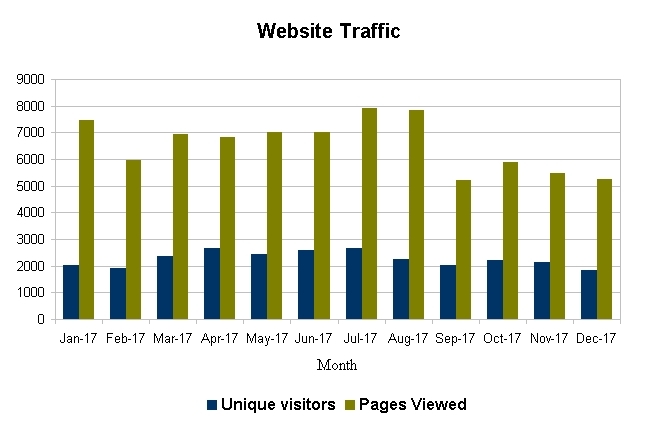 The days with the most traffic were December 7th, June 6th and July 16th, a long way ahead of June 13th which came next. The most notable observation on this year's traffic is a large number of overseas readers. As expected, Great Britain viewed the most pages, but that only accounts for just over a third of the pages viewed. 87 different countries made up the remainder of the visitors. The combined totals of top three non-UK countries, USA and the Russian Federation and Ukraine accounted for another third; and the next highest are (in size order) Netherlands, Germany, Ireland, China, Japan and Latvia. The entire website consists of 64 pages containing 1075 pictures, 144 Decision Notices, 205 comments on applications, 65 Enforcement cases, and 62 other documents. Another "Heritage Day" had been planned by the council's former Heritage Champion, but the previous one in September 2016 was the first one when the management of the Bath City Football clubhouse asked for a room rental charge greater than could be covered by the sales of cakes and sandwiches, and the event made a small loss. When attempts to negotiate a smaller charge failed, and no alternative location with sufficient free parking could be found, it was reluctantly decided to discontinue what had been popular events. Of all these applications, 36 of the applications were withdrawn by the applicant. 18 were withdrawn after we had submitted a comment; 18 of the applications were withdrawn by the applicant before we had submitted a comment. Of all these applications, 4 of the applications were closed with a reason "Planning permission not required". 3 of these were closed after we had submitted a comment; 1 of the applications were closed before we had submitted a comment. All of our comments eventually showed on the on-line system, though 10 of them needed a prompt from us to get the text made visible to the public. The numbers for this year are lower than in previous years, mostly because we had less available resource devoted to routine planning while so much of our time has been taken up with liaising with Network Rail about the electrification of the line through Bath (see below). Nevertheless we believe we have adequately covered the more important applications. 4 of the Refuse decisions went to appeal. We examined the Appeal documentation of all of them and for all 4 of them we concluded that our objection comment was detailed enough that no further input was needed into the appeal process. We were informed a long time ago that when a retrospective planning application was refused, that refusal would automatically be passed to Enforcement for action. How often this happens we don't know, because the Enforcement register is not on-line for the public to view. We have noticed that very few, if any, such cases were enforced to the extent that the changes refused were reversed. If there are any further improvements made to the planning system, an index of enforcement cases quoting the number, the status (ongoing or closed with the outcome), the address and a brief description of the substance of the case would be very useful; we don't think that there is a need to have the documentation available. We reported to Enforcement 4 cases. We were advised of case numbers for 4 of these. No outcomes were notified to us. We would like to see a policy review to tackle this issue. The problems recorded during 2016 have been very few, and are all about periods of unavailability of the service, most of which have been associated with a software delivery process. It looks as though the teething problems with the system have now been resolved. In round numbers we had 16,300 separate visitors making a total of 31,650 visits to our website this year, and in total they looked at 73,500 pages. On average each visit was to read 2.3 pages. 64,800 pages is an average of 177 pages read for each day in the year, or about 5,400 a month. The days with the most traffic were all in January: on 5th, 8th and 3rd. The next highest was October 2nd. The most notable observation on this year's traffic is a large number of overseas readers. As expected, Great Britain viewed the most pages, but that only accounts for about a third of the pages viewed. That figure reveals that about two thirds of the pages viewed were viewed abroad. In fact the combined totals of USA and the Russian Federation accounted for another third; and the next highest are (in size order) Ukraine, Germany, France, Japan, Ireland and China which in aggregate make up about 20% of the total. The entire website consists of 64 pages containing 1067 pictures, 110 Decision Notices, 203 comments on applications, 46 Enforcement cases, and 56 other documents. Another "Heritage Day" was arranged by the council's former Heritage Champion, in September, and Watchdog was invited to exhibit again; and we added to our already extensive library of heritage subjects so that even those who had attended the previous events found something new to interest them. This was the first Heritage Day that didn't clash with anything else, and whilst the attendance was similar to previous events, there were no particular peaks and troughs as people came and went throughout the day. Network Rail had arranged a series of public consultation events on the electrification scheme, culminating in an announcement near the end of 2016 that electrification of the Bath loop line would be deferred. We were informed that the delay was for financial rather than technical reasons. The students of School of Architecture in Notre Dame University had intended to conduct another exercise on ideas for Bath, but the refugee crisis and the need to temporarily house them adequately but cheaply diverted their attention towards the countries suffering the main influx and their need to provide utilitarian temporary housing. Effectively, the students designed a residential and administrative processing facility using only locally sourced materials, a design that could be replicated wherever it was needed. Of all these applications, 27 of the applications were withdrawn by the applicant. 11 were withdrawn after we had submitted a comment; 16 of the applications were withdrawn by the applicant before we had submitted a comment. Of all these applications, 8 of the applications were closed with a reason "Planning permission not required". 5 were closed after we had submitted a comment; 3 of the applications were closed before we had submitted a comment. All of our comments eventually showed on the on-line system. We reported to Enforcement 1 case. We were advised of case numbers for 1 of these. 1 was considered not expedient to take action. The problems recorded during 2015 have been few, and are all about periods of unavailability of the service. It looks as though the teething problems with the system have now been resolved, and if that experience continues into 2016 then it may be time to discontinue that diary. In round numbers we had 16,700 separate visitors making a total of 36,500 visits to our website this year, and in total they looked at 73,500 pages. On average each visit was to read 2 pages. 74,000 pages is an average of 201 pages read for each day in the year, or just over 6,000 a month. December 24, January 29; May 24; April 16. 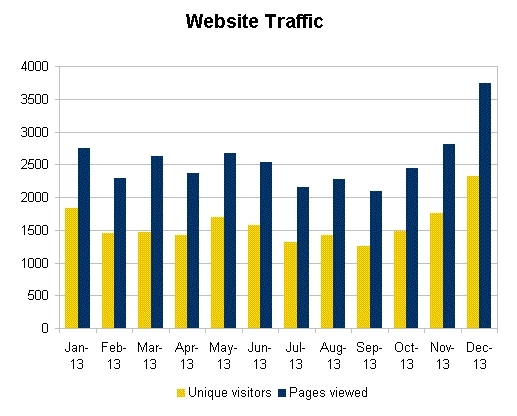 The most notable observation on this year's traffic is a large number of overseas readers. Unfortunately the statistics are now delivered as twelve separate monthly figures, some of which have to be manually decoded to identify the country of origin. So far we have interpreted most of January, which reveals that American readers made up roughly a quarter of the pages read. We will continue with the analysis of the remaining months as time permits, aiming to update this page with a whole year view of the readership. The entire website consists of 64 pages containing 1056 pictures, 95 Decision Notices, 199 comments on applications, 41 Enforcement cases, and 47 other documents. Another "Heritage Day" was arranged by the council's Heritage Champion, in March, and despite the new council after the May Local Election dispensing with "Champions", the former Heritage Champion responded to popular public demand and arranged another "Heritage Day" in September. Watchdog was invited to exhibit at both, and each time we added to our already extensive library of heritage subjects so that even those who had attended the previous events found something new to interest them. Both events were well attended, indicating that there is considerable public interest in Bath's industrial past, despite the September event clashing with a Bath City FC home game and the Jane Austen festival. The highlight of the September event was the stand of the Ipswitch Transport Museum showing its plans to restore one of Bath's original horse-drawn trams, and bringing with them part of that tram and a scale model of what the original would have looked like. Network Rail had arranged a series of public consultation events on the electrification scheme, and behind the scenes we attended a number of "stakeholder" sessions as Network Rail tried to find solutions to the additional problems that views into and across a World Heritage Site, and the need to find arrangements that allowed listed structures to retain their character yet be subject to acceptable modifications that ensured that the public is protected from the high voltage in the overhead wires. This liaison was made more complicated by changes in Network Rail personnel during the year, leaving us to repeat the provision of local knowledge. The students of School of Architecture in Notre Dame University in Indiana once again tackled a Bath location, this time in the former Narrow Quay area (which covered much of the area the council refers to as North Quays. Watchdog had provided maps, photographs and background information, and the professor came to Bath in May to present their results. Unfortunately this visit coincided with the period just after the Local Election and few of the new councillors had found their feet sufficiently to spare the time to attend. Of all these applications, 26 of the applications were withdrawn by the applicant. 15 were withdrawn after we had submitted a comment; 11 of the applications were withdrawn by the applicant before we had submitted a comment. All of our comments eventually showed on the on-line system (but see "Planning Website" below). Of the Refuse decisions which went to appeal, we examined the Appeal documentation and in each case we considered our planning comments originally submitted were sufficiently detailed that we had no additional grounds to submit to the Appeal Inspector. We were informed a long time ago that when a retrospective planning application was refused, that refusal would automatically be passed to Enforcement for action. How often this happens we don't know, because the Enforcement register is not on-line for the public to view. We have noticed that very few, if any, such cases were enforced to the extent that the changes refused were reversed. We reported to Enforcement 35 cases. We were advised of case numbers for 23 of these. We have re-requested case numbers for the remaining 12 without success. 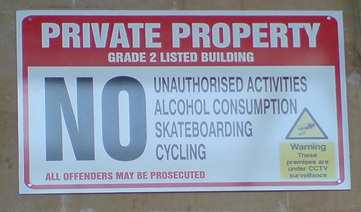 1 was closed with an opinion that the unauthorised signage had Deemed Consent because it replaced an earlier sign. We dispute this because the materials, character and method of mounting are different, but nevertheless the case remains closed. Last year we said "In a number of our comments on Listed Building applications we have expressed our concern and disappointment that no pre-application advice had been sought. We are also concerned about the number of planning applications for listed buildings where advice is given by officers with insufficient or no expertise in listed buildings, and the advice given shows insufficient care of the heritage assets, despite the legislative background to the determination of normal planning applications and listed building applications being different". This still remains our view; no improvement has been seen. We also have noted that at least one DCC discussion did not recognise that Listed Building applications should be evaluated against different legislation to the usual applications. We would like to see a policy review to tackle this issue, which should include appropriate training. Although Watchdog took no active part in the proceedings, we noted that the ruling of the Tribunal that examined the status of the Rec (and therefore can be regarded as pre-application advice) had been ignored as far as the recent planning permission for the East Stand is concerned. It remains to be seen whether the appeal against that Tribunal ruling decides whether such a planning decision effectively puts Planning in contempt of court. On a separate page of this website we have been recording the service problems with the Council's on-line facilities. Our diary chronicles the experiences that any user of the website would have seen from time to time. It is encouraging that there have been fewer occasions to add to this page as time went on. The planning system has been modified so that makes it clear that it is now possible to comment on open applications after a computer calculated theoretical date by which comments should have been submitted. This is considered to be an improvement on last year's system. Also at the end of 2014, the method of presenting planning documentation was changed, with some comments and consultations being under the "Documents" tab and many public comments being found under the "Comments" tab. When we queried the rationale, we were assured by the council department responsible that this was an improvement. We disagree; it was far more useful to have everything in one list so that it was obvious from the dates which public comments were available to the statutory consultees before they submitted their consultation advice. We would like to see all documents in a single list once more, but fear that for a while at least we will be stuck with the current clumsy system. We wonder whether an Appeal Inspector would find and read the public comments when they are presented as several pages because the limit appears to be just ten comments on each page, when the previous arrangement was to have everything in a single list of unlimited length. Perhaps if enough Appeal Decisions criticise the way the documentation is presented, the system will be changed back. The other defect we have reported on the planning system is the "Weekly List" feature. We use this to identify new applications for our own weekly list. We expect the planning website list to show all the new ones when viewing the latest date. Unfortunately, when we investigated an enquiry from a member asking why we hadn't listed a particular application, we found that it had been added to a backdated list. At the start of 2015, our first "New Applications" of the year had to be collated from four previous "Weekly List" dates to identify all the newly added applications. This has been reported to the council and we have received confirmation that this is a system fault, be we have no forecast of when it will be rectified. We have noticed several inconsistencies with the records on the planning website. Some public comments were stored in an almost illegible font and no attempt appears to have been made to repair these. Where the applicant has asked for their application to be withdrawn, some confirmation letters have been correctly posted as "Decision" which closes the application; others have this incorrectly filed as "Correspondence". 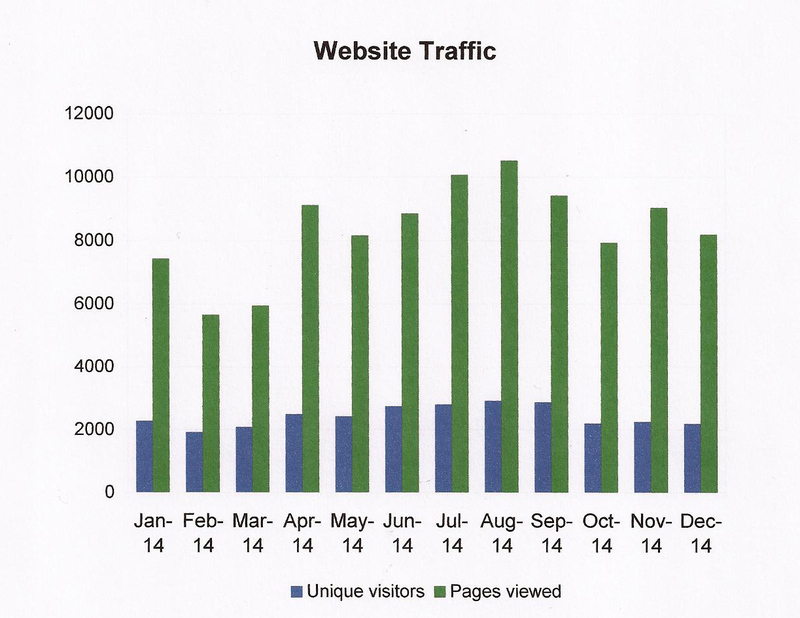 In round numbers we had 50% more website traffic this year than we did in 2013. 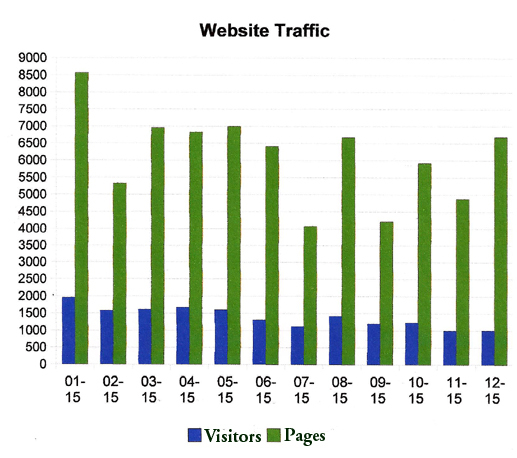 There were 29,000 separate visitors making a total of 50,000 visits to our website this year, and in total they looked at 100,000 pages. On average each visit was to read 2 pages, giving a daily average of 275 pages read for each day in the year, or nearly 8,360 a month. Unfortunately our website host has changed the way that traffic statistics about where this traffic has originated, leaving us with a lot of arithmetic to do to to derive the "top 10" countries viewing that we presented last year. We will publish it here as soon as we have completed the calculations. The entire website consists of 65 pages containing 1014 pictures, 95 Decision Notices, 226 comments on applications, 83 documents on Enforcement cases, and 91 other documents. Another "Heritage Day" was arranged by the council's Heritage Champion in the spring. Watchdog was invited to exhibit, and we added to our already extensive library of heritage subjects so that even those who had attended the previous year's events found something new to interest them. Once again the event was well attended, indicating that there is considerable public interest in Bath's industrial past. Another similar event is being planned for March 2015, and Watchdog will publicise it nearer the date and once again take part. The council formally adopted the Core Strategy at the end of the review process, thus formally adopting as council policy their Building Heights Strategy which had previously only been a consultation draft. The Core Strategy also lowered the threshold of the number of dwellings in a development before the provision of affordable housing becomes a mandatory part of the development. Whilst Watchdog took no part in it, we watched with interest as the Charity Commission put forward a variation to their previous position on the Rec, which was followed by a legal challenge where the Tribunal hearing the challenge rejected the variation as being incompatible with the 2002 High Court Judgement which identified the Rec as land held in trust by the council, casting doubt on the legality of the currently appointed Trustees. At the time of writing, this Tribunal ruling is the subject of an appeal which has yet to be heard. We will be watching for the outcome of this appeal. After Watchdog met the Network Rail team looking at the electrification scheme for the line through Bath, there was a change of the personnel in the team and we met the new incumbents and walked the route through Bath with them so they could see at first hand the issues described in their documentation and recognise the significance of the listed structures along it. Since then, Network Rail has run a series of public consultation events so that residents could view and discuss the scope of the installation work with Network Rail, and the plans that First is developing to maintain rail services during the installation process. We applaud both these organisations for their commitment to keep the public informed, and note from the level of attendance at these events that the public is showing a real interest too. We have watched the restoration of Victoria Bridge with interest, and the finished product looks very good. We hope that the level of maintenance from now on is sufficient to keep it in good condition. There is an anomaly though in the the planning system still has the applications for the temporary emergency girder footbridge through the structure as "Pending Consideration" despite it having served its purpose and having now been dismantled. The most demanding issue for 2014 will be the GWR Electrification Programme itself. We have established that electrification of the line through Bath is inevitable, but that Network Rail have set up a dedicated team to handle the Bath loop, and have employed heritage architects to advise on the most appropriate designs for Bath in order to create the minimum impact. Watchdog hopes to continue the dialogue with Network Rail as their plans progress. Despite Watchdog attending all the original public consultations on the Bath Press Site and all the subsequent workshops, and despite advising on what would and wouldn't be likely to secure planning permission, that advice was ignored and plans for a Tesco Store were produced, and as we predicted were refused. The proposal was the subject of a full Public Inquiry which concluded that Tesco should not have planning permission for their store. We note from the local press that Tesco are intending to put forward a residential development, and we hope to take part in whatever consultation precedes a formal application. Inside the current building is Sir Isaac Pitman's Phonetic Institute from the 1890s so the building is locally important and deserves more respectful treatment than was proposed for the store. Last year we reported that the other neglected building that deserves a better fate than being left derelict is the Newark Works. Built to the design of Thomas Fuller who left Bath soon afterwards to become the National Architect of Canada, and built for Stothert and Pitt who was for many years the biggest employer in Bath, and from these works, the last survivor of the vast Stothert and Pitt enterprise, came many of the iron and steel structures used by Brunel in the construction of the Great Western Railway, this is a very sensitive site for many reasons. Fuller's building is also identified by English Heritage as having group value with the other industrial buildings, so we would expect an approach reusing the entire group in the council's vision for "South Quays" but that hasn't happened. The scheme to improve flood protection puts part of the site on the river side of the flood barrier, effectively sacrificing part of the site to the river, yet other reports in the press suggest that the whole site has been offered to a local business, apparently without a tender exercise (which appears to be incompatible with EU Competition directives) and the local press has indicated a modern (and inappropriate in the context of the listing) development along the lines of this picture. A further proposal, which appears to be far more compatible with the buildings and archaeology preserved there and the English Heritage vision of the site is one reported by us with the "Craneworks" project name, but as yet there is no indication that the council is inclined to support this. This intentions for this site are therefore masked in misinformation and we will need to watch future announcements closely. Our remaining concern is the scant regard being given to the Core Strategy. According to the adopted strategy the council has housing targets to meet, and residential expansion of student accommodation is expected to be on-campus. Yet in the comments on student accommodation applications, the council is actively promoting student flats over residential development on almost every available development site in Bath. If these go ahead, then the target residential accommodation numbers (which will be monitored by the Government) will only be achievable by building skyscraper "rabbit hutch" developments to ruin the World Heritage skyline. The Cabinet needs to get a grip on this before the disregard of the Core Strategy becomes irrecoverable. Of all these applications, 46 of the applications were withdrawn by the applicant. 31 were withdrawn after we had submitted a comment; 15 of the applications were withdrawn by the applicant before we had submitted a comment. 4 of the Refuse decisions went to appeal. We examined the Appeal documentation of all of them and for 3 of them we submitted further grounds to the Appeal Inspector; for the other 1 we concluded that our objection comment was detailed enough that no further input was needed into the appeal process. We reported to Enforcement 21 cases. We were advised of case numbers for 11 of these. We have re-requested case numbers for the remaining 10 three times so far, without success. 1 was closed as a duplicate of an existing case but we have not been provided with that case number. We were informed an application was due "shortly" but at the time of writing, nearly five months after being given that information, this application is still awaited. Unfortunately the current on-line system times out the opportunity to comment on a calculated date, and that date is only rarely reset to recognise revised drawings. The previous system had no such time-out and comments could be submitted for as long as the Case Officer was considering the application. We would like to see the time-out removed completely, but failing that the system should honour the council's commitment to the public in the Customer Charter and adjust the time-out date whenever revised drawings are lodged. In March 2013, We were informed that the handling of listed building applications would be changing, with Case Officers handling the normal and listed building applications, seeking advice from the Heritage Environment Team on the listed building aspects. We reviewed the outcome of this policy change for 6 months and then sent a report to the head of planning identifying the occasions where this policy change had failed to deliver the quality of decision making process that it should have done. This report was not concerned with the decision actually made, only on the way that the planning applications were handled up to the point of decision. We received no response to our itemised list of deficiencies which included failure to consult with the Heritage Environment Team, or having consulted, dismissing the advice given. There were also several instances where decisions were made too close to the receipt of revised drawings, giving the public no opportunity to comment on the revisions, despite the undertaking in the council's Customer Charter, that any revised drawings should have a 14 day window of opportunity for the public to consider the amendments and make comments on them if desired. Our observations since we submitted our report suggest that there has been little or no improvement of the deficiencies we reported earlier. 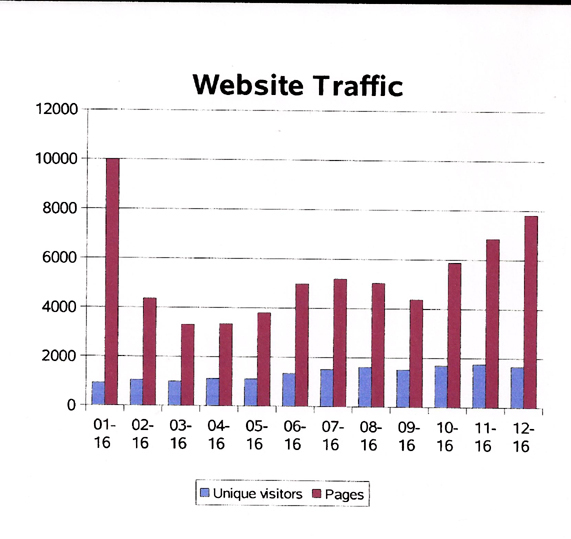 In round numbers we had 19,000 separate visitors making a total of 31,000 visits to our website this year, and in total they looked at 74,000 pages. On average each visit was to read 2.4 pages, an increase over the previous year's average of 1.8. 74,000 pages is an average of 203 pages read for each day in the year, or nearly 6,200 a month. November 12; February 5; June 5; May 22; May 2. The most notable observation on this year's traffic is a large increase in overseas readers, to the extent that twice as many pages were read in America than were read in the UK. America accounted for 31% of our read pages. The remainder of the "top 10" (in alphabetical order) were Australia, Canada, China, France, Germany, Israel, Turkey, and Ukraine and together they account for 18% of the pages read. In most months just over 60 different countries visit our website at least once. We extend a warm welcome to all of them. The entire website consists of 73 pages containing 970 pictures, 212 Decision Notices, 205 comments on applications, 25 Enforcement cases, and 40 other documents. Another "Heritage Day" was arranged by the council's Heritage Champion, in April. Watchdog was invited to exhibit, and we added to our already extensive library of heritage subjects so that even those who had attended the previous year's events found something new to interest them. Elsewhere in the event the focus this time was on household memorabilia, alongside information on the larger industrial heritage. Despite the coincidence of the exhibition and the opening of the "Two Tunnels", the event was well attended, indicating that there is considerable public interest in Bath's industrial past. Revisions to the council's draft Core Strategy resulted in the preparation of further comments to the Planning Inspectorate as they reviewed and negotiated on the contents. The process continues into 2014. Network Rail arranged a consultation on how the electrification scheme, and the need to protect the public from the high voltages involved, might affect Sydney Gardens. This resulted in the elimination of a number of possible options and a small number of broadly acceptable schemes to be the subject of further study. Meanwhile the fence in Sydney Gardens which was installed as a result of a Health and Safety Notice from the Rail Regulator will stay until something better can be agreed, and that something better is likely to coincide with the Electrification Programme. There are some saving graces in that although is not pretty it does allow children to look through it and it is not too tall for photographers to hold cameras above it, so it has not caused much of a backlash despite its rough and ready appearance. Brunel's railway heritage in Bath was formally commemorated by the installation of a "Red Wheel plaque on Bath Spa Station. We added details of its significance on the Red Wheel section of our GWR page. The students of School of Architecture in Notre Dame University in Indiana once again tackled a Bath location, this time in the Manvers Street area. Watchdog had provided maps, photographs and background information, and the students came to Bath in May to present their results, in two sessions, one for the general public and one to an invited audience including many council representatives. We put a brief overview on the Notre Dame page. The most demanding issue for 2014 will be the GWR Electrification Programme itself. We have established that electrification of the line through Bath is inevitable, but that Network Rail have set up a dedicated team to handle the Bath loop, and have employed heritage architects to advise on the most appropriate designs for Bath in order to create the minimum impact. Watchdog has met the team at the consultation on Sydney Gardens and hopes to continue the dialogue with Network Rail as their plans progress. The students of School of Architecture in Notre Dame University in Indiana have once again been in touch seeking location information on their next project area for Bath, this time in the Avon Street and Green Park Road area, similar to though not exactly the same as the council's "North Quays" development area. We will support them as we always have done. The Bath Press site was the subject of a full Public Inquiry which concluded that Tesco should not have planning permission for their proposals. We will be watching with interest what proposals are now made for the site, and hope that whatever is put forward makes better use of the existing structures than the ugly facadism proposed by Tesco. Inside the current building is Sir Isaac Pitman's Phonetic Institute from the 1890s so the building is locally important and deserves more respectful treatment in future. The former Herman Miller building is another concern. Both the building and the land around it is in two ownerships, and the listed building is gradually deteriorating while the two parties jockey for advantage. In order to break the impasse the council has proposed that separate planning applications should be processed for different parts of the building, but this has the risk that part of the building will be restored and the remainder left to deteriorate. We would like to see the council compulsorily purchase the site on the grounds of dilapidation and then sell it back to whichever party has the best and quickest programme for restoring the entire building and bringing it back into use. There have been several public consultations mounted by Bath Rugby to extend their presence on the Rec. The feedback within Watchdog has been mostly concerns about the sheer scale of the proposed structures and the potential impact on important views, which we have fed back into the consultation process and we intend to continue the dialogue with the club in the hope of finding a compromise between the increased capacity desired by the club and the need to comply with the Outstanding Universal Value of the World Heritage Site. The planning process, if it eventually takes place, is by no means clear cut either, because the various amendments to the Core Strategy since the original draft has resulted in the initial agreement that there could be development on the Rec being deleted. The legal position is also rather complex, because despite the creation of additional Trustees to oversee the management of the site, the High Court Judgement was that the council is the owner of the land to be held in trust, and that the covenants are part of the council's obligations, which would appear to put the council in contempt of court if it does not uphold the covenants. We will watch developments with interest. Planning permission has been sought for the Victoria Bridge restoration, which is welcomed. As the first of James Dredge's revolutionary design for bridges (it looks like a suspension bridge, but in engineering terms it is a double cantilever) it deserves restoration as originally built, and then better care than it has had in the past, where it was allowed to deteriorate until emergency action had to be taken. We will watch the progress of the restoration with considerable interest. The other neglected building that deserves a better fate than being left derelict is the Newark Works. Built to the design of Thomas Fuller who left Bath soon afterwards to become the National Architect of Canada, and built for Stothert and Pitt who was for many years the biggest employer in Bath, and from these works, the last survivor of the vast Stothert and Pitt enterprise, came many of the iron and steel structures used by Brunel in the construction of the Great Western Railway, this is a very sensitive site for many reasons. Fuller's building is also identified by English Heritage as having group value with the other industrial buildings, so we would expect an approach reusing the entire group in the council's vision for "South Quays" but fear that the demolish and replace approach in the Cullinan Report (see picture) still has adherents in the council if the "contemporary approach" quote in the Chronicle recently is to be believed. It is possible to build modern buildings that fit into the street scene without being a copy or clone of anything else (Seven Dials is a good example), but unfortunately the council's use of the word "contemporary" tends to mean something that looks hopelessly out of place and dates very quickly. This is a scheme we will need to watch closely. Of all these applications, 19 of the applications were withdrawn by the applicant after we had submitted a comment; 12 of the applications were withdrawn by the applicant before we had submitted a comment; and 2 were withdrawn by the case officer because the planning application was was not necessary. A small number of Refuse decisions went to appeal. We examined the Appeal documentation of all of them but concluded that our objection comment was detailed enough that no further input was needed into the appeal process. We were informed a long time ago that when a retrospective planning application was refused, that refusal would automatically be passed to Enforcement for action. How often this happens we don't know, because the Enforcement register is not on-line for the public to view. We noticed just one Decision Notice that specifically said the refusal was to be passed to Enforcement, but whether others have been similarly passed on or not we cannot know. What we do know is that the limited number of notifications to Enforcement that we have made don't all get allocated a Case Number, and none of them (not even the ones that did have an allocated Case Number) have resulted in unauthorised works being stopped or restored. We have only reported what we regard as serious damage to the structure or appearance of listed buildings (having discovered that changes to colour are never considered expedient to enforce, regardless of the impact on the street scene), so we regard the lack of action as being tacit acceptance of illegal activities. Unfortunately this lack of care about what happens to listed buildings is leading to a greater number of retrospective planning applications, and in most of those cases the damage has been done and heritage assets have been damaged or destroyed, and nothing is done to restore them even if the application is refused. We are concerned about the number of planning applications for listed buildings where advice is given by officers with insufficient or no expertise in listed buildings, and the advice given shows insufficient care of the heritage assets. We are also concerned about the number of listed building applications where no advice has been sought: for some of these we have recommended in our comment that there is so much wrong with what is proposed that the applicant should withdraw the application and seek the advice of an experienced Conservation Officer. On 3 occasions the delay between submitting comments and them appearing online was abnormally long. On 1 occasion our comment showed up promptly but a week later it had vanished. On 1 occasion our comment did not appear at all until we sent it again. On 1 occasion our comment was wrongly filed on an entirely different application. On 4 occasions our comment was wrongly described, such as a support comment being described as an objection or an objection described as a general comment. The other service drawback is that according to the council's Customer Charter, any revised drawings should have a 14 day window of opportunity for the public to consider the amendments and make comments on them if desired. Unfortunately the current on-line system times out the opportunity to comment on a calculated date, and that date is almost never reset to recognise revised drawings. The previous system had no such time-out and comments could be submitted for as long as the Case Officer was considering the application. We would like to see the time-out removed completely, but failing that the system should honour the council's commitment to the public in the Customer Charter and adjust the time-out date whenever revised drawings are lodged. In round numbers we had 28,000 visitors to our website this year, and they looked at 51,000 pages. That is an average of 138 pages read for each day in the leap year, or 4,200 a month. April 22; May 30; April 1; April 4; September 17. France and China read 2% each. Russia, Germany, Australia, Canada and Japan read just under 1% each. Several other countries take an occasional look. The entire website consists of 63 pages containing 973 pictures, 154 Decision Notices, 253 comments on applications, and 37 other documents. Two "Heritage Days" were arranged by the council's Heritage Champion, in April and August. Watchdog was invited to exhibit at both. At the first we concentrated on the industrial heritage of Twerton, Locksbrook and Lower Weston, and with a bit more notice for the second one we were able to extend our coverage to Stothert and Pitt and the Oldfield Park area, along with details of wartime damage. Both exhibitions were well attended and there is very obviously a lot more public interest in industrial heritage than the World Heritage Management Plan recognises. There will be another similar exhibition on 6th April 2013 and we are already preparing material for it. Much time and effort went into examining the council's draft Core Strategy and commenting on it, and then responding to the various consultation papers issued by the Planning Inspectorate as they reviewed and negotiated on the contents. Ultimately no decision was reached and the process is due to restart next spring. A number of the sticking points are where the council clings to "hobby horses" which have little public support and no real justification. After last year's consultation, the National Planning Policy Framework became Government policy this year. Despite all the hype at the time about simplifying planning by removing many of the former planning policy documents, none of the underlying legislation was changed, and the deleted documents which were mostly aimed at interpreting the underlying legislation have been reissued under different names because that interpretation was found to be still needed. Essentially nothing much has changed, but we have to use different words in our comments on applications. In April, the council issued its policy on "A" boards, and despite the success of other tourist area authorities (York, Cambridge, Cornwall etc) in banning them altogether, and despite the fact that the Town Police Clauses Act says that they are illegal and punishable by fines or imprisonment, the council decided to allow them subject to restrictions. We did our own surveys, in March (before the policy was announced) and then in May and July, and we discovered that the introduction of the new policy had made virtually no difference to what we saw on the streets. What has happened is that those who flout the restrictions are allowed to get away with it. The press release when the policy was announced said "This will not be a toothless policy". But it is! It is time for a rethink. We recommend a total ban. We were approached by the Red Wheel scheme for advice on sites worthy of commemoration and we guided them through the process of gaining listed building consent for a plaque for Bath Spa Station similar to that installed on Claverton Pumping Station, and we look forward to the approved sign being installed soon. The GWR has been our most challenging issue. The fence in Sydney Gardens was installed as a result of a Health and Safety Notice from the Rail Regulator. It will have to stay until something better can be agreed, and that something better is likely to coincide with the Electrification Programme. There are some saving graces in that although is not pretty it does allow children to look through it and it is not too tall for photographers to hold cameras above it, and it has been installed without any damage to the listed structures near it. As a response to a "do it now" edict, it could have been a lot worse. The most demanding issue for 2013 will be the GWR Electrification Programme itself. We have established that electrification of the line through Bath is inevitable, but that Network Rail have set up a dedicated team to handle the Bath loop, and have employed heritage architects to advise on the most appropriate designs for Bath in order to create the minimum impact. Watchdog has met the team twice, once to be briefed on the approach to be taken in Bath, and once to discuss what maintenance and improvement is appropriate as part of electrification and what needs to be treated as urgent maintenance before then, which is mostly weed-killing before roots cause more serious damage to listed stone. The students of School of Architecture in Notre Dame University in Indiana once again tackled a Bath location, this time in the Manvers Street area. Watchdog provided maps, photographs and background information, and towards the end of 2012 received feedback from the Professor that it was challenging and is going to be reused with the 2013 intake so that lessons can be drawn from comparing the 2012 and 2013 results. We understand that this approach has been taken partly because the university funding did not allow a trip to the UK and a presentation in Bath as had been arranged for previous projects. We have been told to expect some drawings to be sent to us in the new year so that we can see what the students of 2012 produced. The Bath Press site was due to be discussed at the DCC but was withdrawn just before the meeting, so there is still no decision. We believe that there is scope for creating something on the site that is appropriate for Bath, but that the unsympathetic token retention of the facade and the destruction of everything else above ground falls a long way short of what we would like to see. We attended all the consultations and all the workshops that were held before Tesco was mentioned, and we recommended workable solutions for the site (all of which have so far been ignored), and we would like to see the current plans refused permission so that the site owners have an incentive to prepare a better scheme. The former Herman Miller building is another concern. The building and the land around it is in two ownerships, and the listed building is gradually deteriorating while the two parties jockey for advantage. We would like to see the council compulsorily purchase the site on the grounds of dilapidation and then sell it back to whichever party has the best and quickest programme for restoring the building and bringing it back into use. The current impasse has gone on far too long. 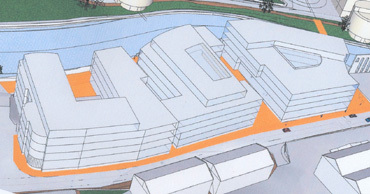 We would also like to see something better designed for the Carr's Mill site. Each plan so far has been aimed at cramming as much as possible within the site boundaries, regardless of the impact on the surrounding listed properties and regardless of the character of Bath being one of spaces and sight lines between buildings and a relatively low height scale. The heritage events have shown that there is a lot of public affection for the bit of the original Mill that still remains, and any future development needs to respect that. Speculation continues on what might happen to the Rec, with suggestions on a land swap once again being made in the press. We have previously reviewed the legal background on The Rec and reported that there are protective covenants on the land "as conveyed" and not as managed by the Trustees after a land swap. We doubt whether the cost of having this point argued in court (once again!) is the best use of council taxes. As work continues on the Western Riverside site, we do hope that we soon see the Victoria Bridge restored and that a practical proposal for the reuse of the historic Destructor Bridge might be forthcoming rather than seeing this former Somerset and Dorset Railway survivor scrapped. After we had commented, 52 of the applications were withdrawn by the applicant and 6 were withdrawn by the case officer because the planning application was was not necessary. Appeals. Where the applicant appealed against the council's planning decision, we noted 19 appeals where we had commented on the application, and for 5 of these we submitted additional information to the Appeal Inspector where we thought it appropriate to supplement our original comment in the light of the grounds for appeal. We believe that all of our comments appeared on the council's on-line planning service, though on a few occasions we provided an additional copy of our comments when they had not gone on-line within our review period. The staff reductions in the Planning Department were made on the assumption that the number of applications would be reduced. Our statistics show that the number of cases has remained fairly constant and similar to the previous year's increased number, so the reductions were made on a false assumption and that assumption continues to be false. The staffing levels should therefore be reviewed: planning is a statutory duty and not an optional service. It cannot be cost effective to continue to use consultant case officers to cover resource shortfalls. Whilst we appreciate that the choice to make planning applications available to the public only as on-line documents was primarily a money saving initiative, our monitoring of the service has shown that as the only source of access to planning documents it is not fit for purpose: its reliability isn't good enough, documents sometimes go on the wrong file or are wrongly described, and there are too many instances where documents do not get onto the system quick enough, and in a few cases some documents do not get on at all. During the later part of 2011 the original system was replaced, and whilst the new system has the benefit of retrieving planning documents slightly quicker than the old one it has two significant new drawbacks: It prevents comments being submitted beyond a deadline arbitrarily imposed on a calculated date basis, even though case officers would readily accept comments after that date; and the search for properties by address is nowhere near as good as it used to be. Inconsistencies can be found where the Status on the summary shows "Pending Decision" yet on the same screen a decision is recorded and a Decision notice is lodged with the documents. The display of map information by default rather than on request has caused concern for those with limited speed or with a data volume cap on their connection. We still have doubts about the legality of the change because a Local Authority does not have the right to unilaterally change their Statement of Community Involvement (see our press release), and we fully expect the next formal audit of council services to recognise that. We reported 13 cases to the council's Enforcement team. Only 8 were allocated case numbers; no explanation was given why the other 5 were not. Of the 8, we received 5 responses. All said that it was not expedient to enforce the cases we had raised. The problem with finding things "not expedient" is that there is now a general expectation that enforcement action is unlikely, and there seems to be no fear of being caught. We are seeing a gradually increasing number of changes being made, either without an application being raised at all, or before a planning application is raised to retrospectively grant permission. If such permission is refused, no action appears to be taken to ensure that the rejected change is reversed. It brings the planning system into disrepute. • The most popular months for viewing our website are May and June, with February and October close behind. July and November were the quietest. However there is not a great deal of monthly variation (see chart). • On average, 125 pages are viewed each day. • Traffic volumes are fairly constant from 5am to 5pm each day (UK time). Our quietest hours are 10pm and 2am which are only a tenth of the daytime hourly volume. • 31% of our website viewers are overseas, including China, Eire, France, Germany, Japan, Norway, Singapore and USA (the 8 most frequent overseas visitors in alphabetical order). • 53% of our website visitors know the address and don't use a search engine to find us. The entire website in round numbers now consists of 50 pages containing 900 pictures occupying 40Mb on our server. Two items that we watched from the sidelines came to a conclusion after the Local Elections which changed the character of the council. The first was the announcement that the BRT route was to be dropped from the council's transport plans. We had long argued that the type of bus being proposed would be totally unsuitable for central Bath where historic vaults designed for horse and cart traffic would be unable to support such monsters for long. The second announcement was the decision not to oppose the Planning Inspector's recommendation that the land beside the Newbridge Park and Ride should be adopted as a Village Green. What a refreshing change from the entrenched stubbornness of the previous administration! When the Stothert and Pitt steam crane was due in Bath in July, we were invited to watch and record its installation. Despite it being a gloomy wet day, we were delighted to go along, and observed an installation that proved trickier than had been anticipated, but was ultimately successful. After the event we provided a DVD of our video footage and a set of still photographs to Crest Nicholson and the council's Heritage Champion, and provided a summary on our website. Since then one of Watchdog's Committee has been taking an active part in the preservation activities. A similar invitation was received in July to take part in the British Waterways Opening Ceremony on the completion of the restoration of the Pump House chimney and two footbridges over the Kennet and Avon canal. We had a chance to talk to the restorers and learn some of the tricks of their trade, and to take a photo record which we put on our website. The results speak for themselves; the restorations are stunning. After taking an active part in supporting the students and professors from the University of Notre Dame in Indiana during their visit to Bath in 2009, we have continued our contacts with the School of Architecture in that University, and when we were invited by them to send a representative to the University in March 2011, a member of the committee was able to travel there, take part in the scheduled colloquium and review the students' work, and discuss ideas for future Bath based projects. Later, in May 2011 the Professor and most of the students visited Bath to exhibit and discuss their masterplan for the Kingsmead area. We featured both of these events on our website at the appropriate times. At the end of 2011 we were asked by Notre Dame to provide maps, photographs and background information on the Manvers Street area, their 2012 student project. We will be providing our usual level of support to this new intake of students. In September, we were invited to exhibit at the Twerton Heritage Day event, and we prepared a display focusing on Twerton's industrial heritage. This was well received, and we were pleasantly surprised at just how much interest there was in what we showed. We were also delighted with the number of people who came to us with photographs, memorabilia and cuttings that we had never seen before, and with the background information they told us about them. One thing that this event showed is that the general public have a real interest in the history and heritage of Bath that goes far wider than just the Roman and Georgian periods which are what is normally "officially" promoted, and we hope that the Cabinet Member for Sustainable Development takes heed. This was a wonderful event, and we hope that it is repeated. Planning legislation requires the loss of the station ramp to be permitted only if exceptional benefits result, and they don't. Now that the permission to demolish has expired, the council is doing nothing to protect the ramp; yet it should. Hence our choice of the word "contempt". One disappointment in 2011 was the announcement in March of the new Tentative List of World Heritage Sites which did not include the Great Western Railway. We said at the time that we were sceptical of the reasons for rejecting our World Heritage bid; and nothing has changed our view since, that heritage comes a long way behind other Government policies, despite legislation being supposedly more important than ministerial desire. Our fear is that if electrification comes through Bath, scant regard will be paid to the fact that many of the railway structures through Bath are listed; and if any get in the way of the cheapest option, they will be sacrificed rather than spend a bit more to preserve them. And given the contempt the council decision makers have shown and continue to show towards Brunel's Grade II* listed ramp at Bath Spa station, we fear that Major Projects and/or the DCC will simply rubber stamp Network Rail's wishes, whatever they are and no matter how destructive they might be. The condition of Victoria Bridge is a real concern. Despite the claims in the council's summary that the deterioration of the bridge was sudden and not the result of neglect, there were obvious signs of neglect in the sheer amount of vegetation growing out of the stonework, and our photographic records show that it had all been left untouched for a number of years, with the roots weakening the stonework for all that time. Dredge used the Victoria Bridge as his advertisements for other bridge requirements he wished to be contracted for to the same design, and Victoria Bridge was deliberately over-engineered to be impressively strong (much stronger than the similar Bridge of Oich). There has to be a reason why something that was designed to be impressively strong and had stood for 175 years should suddenly be so unsafe that boats had to be banned from going underneath it. Because nobody has explained why it had suddenly gone wrong, there has to be a concern that repairs might not address the real cause. The Bath Press development started with a number of consultation meetings, and Watchdog attended every exhibition and every workshop. It looked as though this might be a rare occasion where the developer sought and actually heeded public opinion. Alas that optimism was short-lived. When the planning application was submitted, the architect chosen had no history of designing anything in the character of Bath, and apart from retaining the chimney from Pitman's Phonetic Institute (see picture), the original building on the site, the input that Watchdog offered was mostly ignored. Then a second planning application was raised that was very similar, and it became almost impossible to decide which was intended to be built or which application drawings were amended on. Given that elsewhere Tesco has successfully adapted treasured old buildings to make their new stores, the disrespect shown to Bath with the plans for effectively destroying the Bath Press building is difficult to understand and impossible to accept after all the consultation (which proved to be bogus). Although it has stopped hitting the headlines, we do not believe that the ambitions that Bath Rugby have for the Rec have been shelved. The council spent a significant amount of public funds trying to convince a court that they owned the Rec and could do with it as they pleased, only to be told by the High Court that they only hold it in trust, and they had to register it with the Charity Commission. Despite this, and the covenants attached to the land, the council and the Rugby Club are still making public statements incompatible with the conditions conveyed with the land, and the council has put policies regarding Bath Rugby into the Core Strategy that we believe are unlawful. Unless the Trustees start to enforce the covenant in the manner that the 2002 court ruling interpreted it, we fear that more public funds, now scarce, will be wasted reaching another very similar High Court ruling. Watchdog has attended all but one of the events organised by Sainsbury's to discuss their future plans, but we still have residual concerns over what might happen to Green Park Station. The station building is well used by businesses, and the train shed could be better used than having much of it devoted to parking. The Farmer's Market thrives there, but for much of the remainder of the week traders are becoming more scarce, and we believe that the decision by Sainsbury's to remove the concession that the traders could park all day in their car park is the start point of that decline. But our real concern is that signs, electrical equipment and long-term sheds appear in the listed structure without listed building consent; indeed without even submitting applications for consent. The sign pictured here, which appeared to remind people that Green Park Station is a listed building was well meant, but it was screwed to the listed wall without listed building consent. That past history doesn't give us confidence that the listed structures will be treated appropriately in any future plans. Watchdog commented at length on the National Planning Policy Framework because despite all the reassurances from various politicians, it is what the document said not their loose interpretations of it that would become law. We found ambiguities and contradictions which would make it a legal minefield, and submitted a substantial report drawing attention to every one of them. We finished our report with the sentence "The Framework needs a major overhaul, and a second consultation afterwards, before it can come anywhere near to being described as fit for purpose" which summarised our opinion succinctly. A lot of our detailed criticisms have been echoed by other organisations, most notably by the National Trust who organised a petition against the Framework, but other powerful opposition appears in the national press from time to time. The only voices in favour of this ill-considered document are the developers who relish the idea of effectively destroying all the controls that have prevented them doing what they please in the past. There are recent suggestions in the national press that the Government might be forced to redraft it. This might then isolate some parts of the Core Strategy which align with the current Framework. As the Core Strategy once adopted will guide council policy for the next 20 years or so we have serious concerns at the current timetable which seems geared to the Core Strategy being finalised before the national policy which is supposed to guide it is enshrined in law. We submitted a large number of criticisms of the Core Strategy, and a few more on the subsequent amendment, and we can only hope that the Inspector takes heed of them. After we had commented, 39 of the applications were withdrawn (either by the applicant or by the case officer because permission was not needed) and so no decision was made. Where the applicant appealed against the council's planning decision, we submitted additional information to the Appeal Inspector on those occasions where we thought it appropriate, but we have not maintained a count of these. We believe that all of our comments appeared on the council's on-line planning service, though on a few occasions when we commented on revised drawings the decision was made and the public comments disappeared from view before we managed to confirm that they had gone on-line. We were properly notified of the planning decision that was made in all but 21 cases. This 21 is over 4% of the notifications we should have received, which compares unfavourably with the just under 2% the previous year. The staff reductions in the Planning Department were made on the assumption that the number of applications would be reduced. Our statistics show that the number of cases has in fact increased compared with the previous year, so the reductions were made on a false assumption. The staffing levels should therefore be reviewed as a matter of urgency: planning is a statutory duty and not an optional service. It cannot be cost effective to continue to use consultant case officers to cover resource shortfalls. Whilst we appreciate that the choice to make planning applications available to the public only as on-line documents was primarily a money saving initiative, our monitoring of the service has shown that as the only source of access to planning documents it is not fit for purpose. Having said that, it is likely that the cost of bringing bought-in software to a state where it is robust enough to be the sole source of information is likely to exceed all the savings from discontinuing paper files. We also have doubts about the legality of the change because a Local Authority does not have the right to unilaterally change their Statement of Community Involvement (see our press release), and we fully expect the next formal audit of council services to recognise that. 38 cases were reported to the council's Enforcement team. All but 2 of these were allocated case numbers. 18 cases were subsequently closed by the officer, and 10 produced no response. There were 2 cases where the work was reversed, and 1 case where unauthorised signage was eventually removed. 2 Retrospective Applications were raised attempting to rationalise the work that had already taken place, but both were refused so the works remain unauthorised and Enforcement action remains outstanding. Enforcement cases are different from planning applications in that we report where we think that something is wrong, usually based on what can be seen from the public streets, and Enforcement Officers (who have a right of entry where we do not) check whether or not unauthorised work has actually taken place. We have concerns about a couple of cases where the officer replied that the work was covered by a planning consent, yet examination of the planning applications revealed that this was not true. However we also recognise that enforcement action can sometimes take a long time, so it would be unfair to comment on the outcome until a case is closed. We have continued to work with Network Rail to establish a programme of routine maintenance to keep under control the invasive weeds endangering the listed railway assets through Bath, and the worst of the infestations were cleared. We also expressed our concern about the condition of the Twerton Station building, and although we did not reach agreement on a full restoration we were pleased to see the Listed Building application to repair the structure sufficiently to make it weatherproof, and the consent for the work just before Christmas. Charlton Court opened for student residents in September. We were pleased to see how the small styling features that we discussed with the architects resulted in a contemporary building that sat so comfortably with the listed Charlton Buildings that it was built astride. We objected to the proposal to change the colour of the ceramic on the Holburne extension and were both surprised and disappointed to discover that the DCC was prepared to revoke their previous condition that the colour had to be in the palette of Bath stone. It remains to be seen what it looks like in the summer, but our concerns that the replacement colour would look gloomy in the dim light of winter has proved to be true now that the external panels are all in position. During the year we successfully demonstrated to English Heritage that two railway bridges were Brunel originals, and they were newly listed. Nevertheless, in the absence of any intention by English Heritage to promote anything for the new Tentative List of World Heritage Sites, Watchdog prepared the submission for Brunel's Great Western Railway. By the end of the year, we had learned that our submission had successfully made the short list for further consideration. Our other major success was to co-ordinate the contributions of the council's Property Services, Network Rail and the Railway Heritage Trust to achieve the restoration of the Skew Bridge Arches. We attended the public exhibition of options for safety fencing to protect the line through Sydney Gardens and although we maintain an "in principle" objection to such fencing on the grounds that the need has not been properly established, we continue to liaise with the interested parties so that if fencing is ultimately installed, we can influence the design and location so that they do the minimum visual damage to the gardens. Our other concern is the timing of the Core Strategy, and we are disappointed that the consultation spans Christmas and New Year when there are many other distractions and demands on people's time. Once adopted it will guide council policy for the next 20 years or so. We maintain that there has to be some recognition that because it is the only World Heritage Site in Britain that is an entire city, some sensible exemptions from the current Governments "one size fits all" policies must be made, and we can only hope that the council has the wisdom and courage to argue that point. All but 7 of our comments appeared on the council's on-line planning service. We were properly notified of the planning decision that was made in all but 8 cases. Thus although the council's performance fell short of ideal, the failure rate as a percentage over a 12 month period is not considered exceptional. 148 cases were reported to the council's Enforcement team. All but 15 of these were allocated case numbers and were followed up. Enforcement cases are different from planning applications in that we report where we think that something is wrong, usually based on what can be seen from the public streets, and Enforcement Officers (who have a right of entry where we do not) check whether or not unauthorised work has actually taken place. We also recognise that enforcement action can sometimes take a long time, so it would be unfair to comment on the outcome just based on one year's figures. Although not directly involved in the work of the architectural students from University of Notre Dame Summer School 2009, we were honoured to be invited to review the early drafts, to discuss with the students their design assumptions; and to advise them of important sight lines, heritage viewpoints, Government guidelines on flood risks and building density, and Local Plan policies. For those who did not get to the public exhibition at the end of the Summer School, some of the designs and drawings are now on-line. Those with dial-up connections should limit themselves to the "Gallery" link from that page. The other links lead to large downloads, only practical via broadband. During the year, we have met some architects and some planning applicants at their invitation, to discuss designs. In most cases we were able to agree on variations to the designs that still met the design brief, but allowed the resulting scheme to sit more comfortably into its surroundings, so we regard this as time well spent. We also appreciate the occasions when we have suggested improvements as part of our comments on planning applications and those suggestions appear in whole or in part in the ultimate planning decision. We were concerned to see the quantity of invasive weeds damaging the listed Brunel features of the railway through Bath, and alerted Network Rail to the damage they were doing to the structures. As a result, weed clearance and essential repairs has taken place near Twerton Station and on the viaduct near Churchill Bridge, and we were informed that a programme of other such work is in hand (as funding permits) for the remainder of the listed assets. We attended the public exhibition of options for safety fencing to protect the line through Sydney Gardens from trespassers, and we did not like any of the alternatives on show. So we responded to the challenge of the exhibitor to suggest something that would be acceptable by preparing four other options of our own. These we copied to Network Rail and to the council's Parks and Historic Environment groups, and we understand that they are the basis for ongoing negotiations. Having read in the Chronicle of the possible redundancies in the planning department we were surprised and disappointed to see how many of the applications we commented on last year had the applications handled by external (consultant) case officers. In most of these cases we think that the consultant misunderstood the character of Bath and came to a decision that was an incorrect interpretation of Local Plan policies. Given that the council spokesman to the Chronicle claimed that the planning load was 22% lower than in previous years, we can see no justification for putting so many applications to outside consultants because either the in-house staff had 22% spare capacity and could undertake the work, or else false figures are being quoted. We are astonished that after the "at risk" letters had been sent out we have so far noticed (at least) two new planning applications which have been allocated to a consultant Case Officer. We have to wonder whether the timing of such an insensitive decision indicates a hidden agenda. And we wonder too how many of the current staff "at risk" could remain at their desks if all use consultant planners were discontinued. From our point of view, during the year we have seen a gradual increase in background knowledge of Bath in the Case Officer reports produced by the in-house staff, particularly some of those in the Historic Environment team, and it seems to be sheer folly to risk the loss of this hard won expertise until after the effect of discontinuing the use of outside consultants has been tried and evaluated. Listed building conservation and alteration guidelines are not just about shapes and sizes, but also methods, materials, colours and finishes, and these vary with time and the preferences of the architect of the original building. We agree with Kirsten Elliott's quote in the newspaper article that there is no such thing as a "straightforward" listed building application, and whoever formulated the council's view that general planning case officers are sufficiently skilled to evaluate the nuances of listed building applications has allowed wishful thinking to supersede common sense. Even with specialist staff evaluating the applications there have been a small number of bizarre planning decisions during the year, so how many more would there be if such staff become too overworked to conduct a proper evaluation, or even worse, had the decisions taken out of their hands? The government guidance in PPG15 is very clear: "Once lost, listed buildings cannot be replaced; and they can be robbed of their special interest as surely by unsuitable alteration as by outright demolition". The same document warns against favouring short term gains influencing decisions which future generations would wish had been made differently. Planning services are supplied as a statutory obligation, and the public has a right to expect properly trained staff with the necessary local knowledge to deal with planning decisions. If there are to be cuts, then those with the best or rarest skills and knowledge should be considered last in the queue. Our other concern is the timing of the Core Strategy. Once adopted it will guide council policy for the next 20 years or so. How much of it will be incompatible with future Government policy after the next general election, we wonder. There has to be some recognition that because it is the only World Heritage Site in Britain that is an entire city, some sensible exemptions from the current Governments "one size fits all" policies must be made, and we can only hope that the council has the wisdom and courage to argue that point.